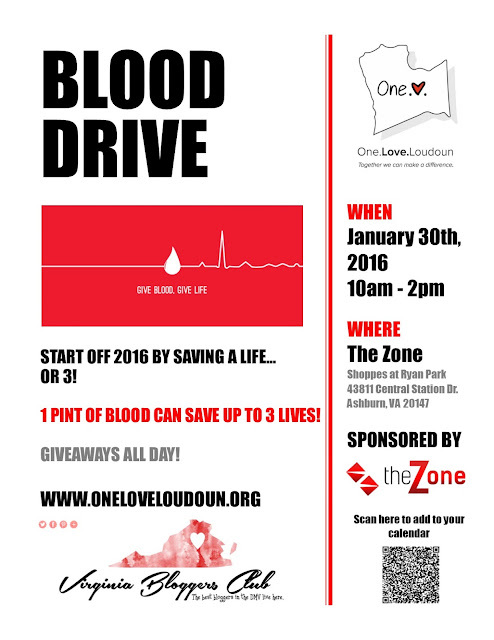 Let's start off 2016 by saving a life or 3! One.Love.Loudoun is hosting a blood drive on January 30th to help those in our community who need the life saving measures of blood. 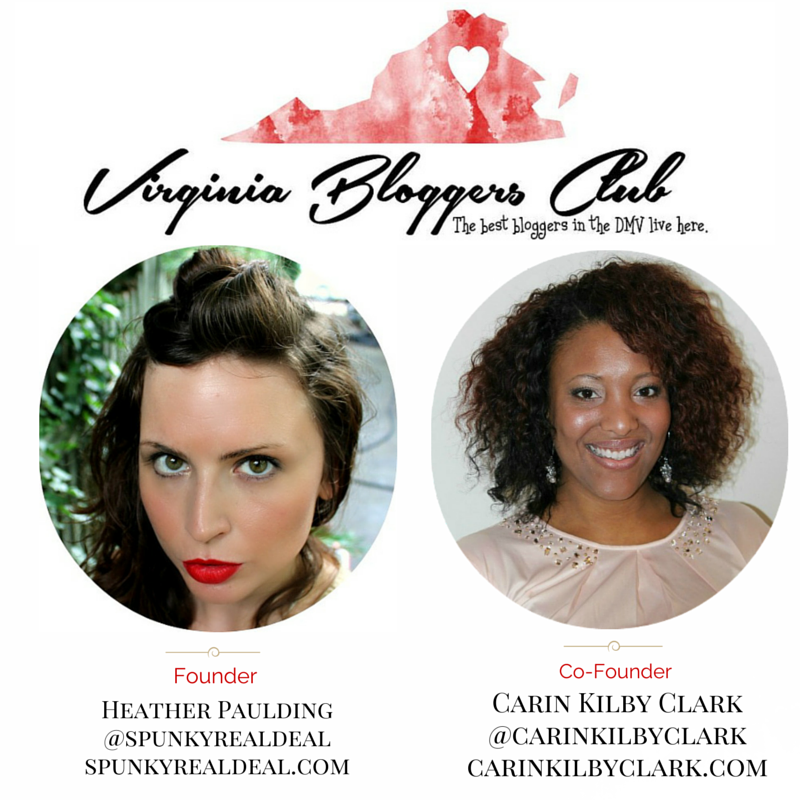 The Zone is generously sponsoring this event as well as the Virginia Bloggers Club. This blood drive will be held from 10 am to 2 pm and giveaways will be held all day! So bring out the family and include "making a difference" in your New Year's resolution for 2016. Need additional information? Visit oneloveloudoun.org and learn how together we can make a difference. 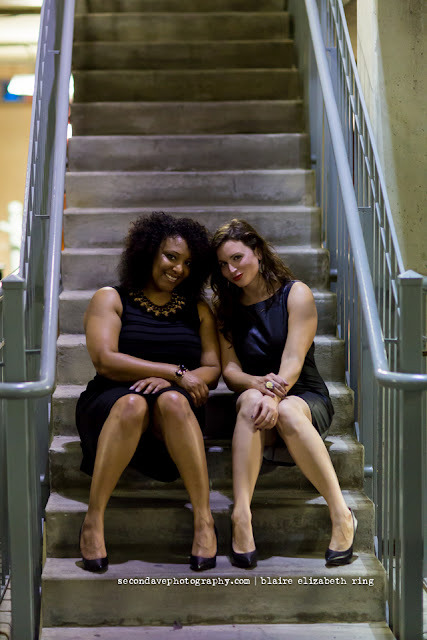 Blaire Ring and I have been working together for a long time. 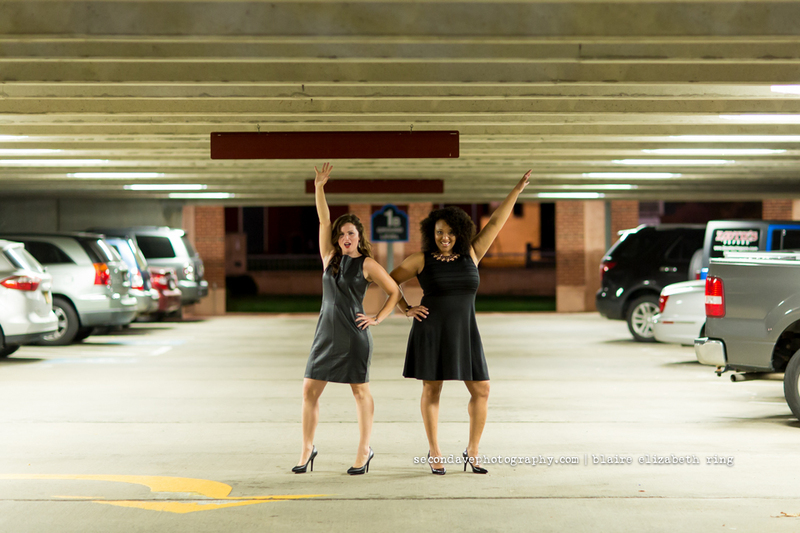 She is one of the most talented, professional, and creative photographers in Northern Virginia! She will try just about anything to obtain an interesting and creative shot. Blaire is my kind of gal. My fellow Scorpio friend and owner of Second Ave Photography kindly gave The Virginia Bloggers Club a fresh + modern look for 2016. Yes, 2016 will be here before we know it and we are already thinking about where we are going next year. Did you ever think about taking photos in a parking garage? No?! Well, I believe in taking something beautiful and putting it in an industrial(non-pretty) setting. The end result is quite striking. Striking is just what I am going for. These photos were taken on first Friday in Leesburg and I would have liked to sit on a random car or lay down in the parking garage, but we may have been tased or ran over(or both). I really love stairwell shots and it took about 20 minutes to get them, because so many people were going up and down the stairs. Don't people know we are trying to have a photo shoot here? 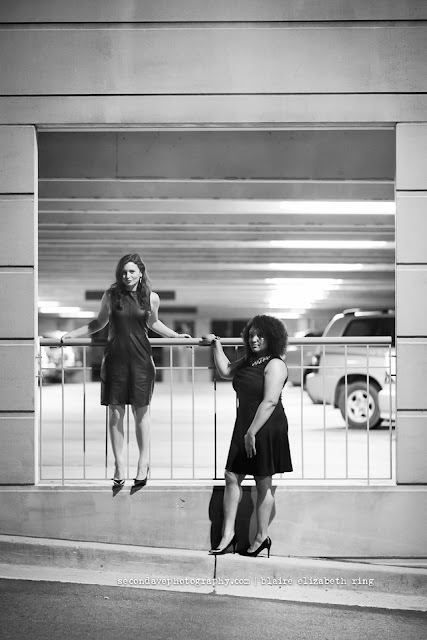 A part of me, okay a big part of me, loves to climb on things during a photo shoot. Let's get crazy! This looks relatively easy, but in heels this is a bit more challenging then it actually looks. Carin, the sensible one, stayed on low ground. 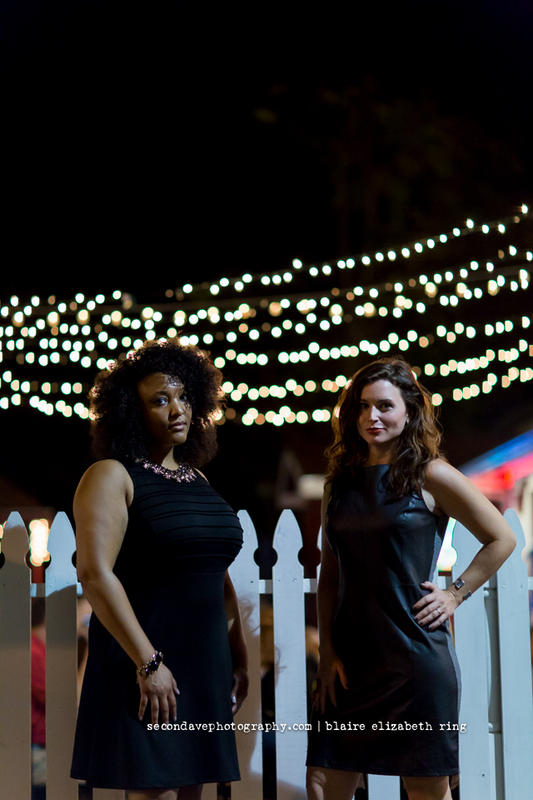 One of my favorite types of photos involves blurred twinkly lights in the background. There is something so bright and magical about these shots. The glow from behind is ethereal and truly beautiful. Mysterious, dark, light, and strong. Such a great mixture of emotions going on in this photo. Then there are times when being silly pays off. Spontaneous + silly photos are some of my favorites. Why did we strike a random pose? Because we could. It does appear very 70ish in styling, but I like it! You should never take yourself too seriously and this is a prime example of that. Looking for some creative shots for yourself or your family? 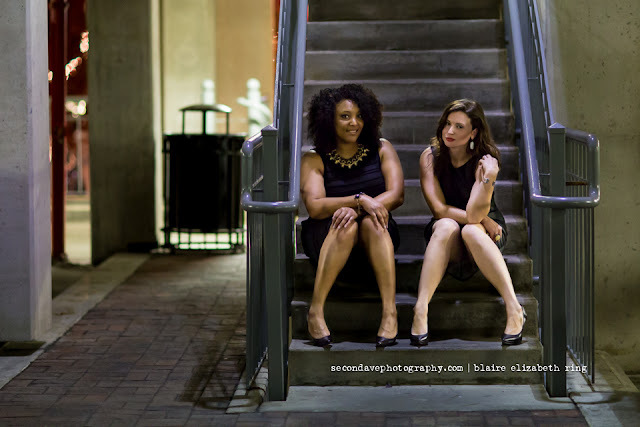 Give Blaire a call or drop her a line at secondavephotography@gmail.com. 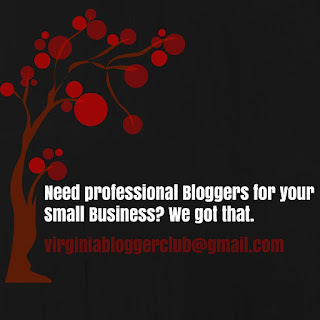 Lastly, if you are a small business owner that needs help with short-term social media promotions or if you are looking to connect with professional bloggers for an upcoming campaign(or event) feel free to drop us a line at virginiabloggerclub@gmail.com. Our list of services and media kit is available for viewing at the top of the blog. Business Motivation: Build it and they will come? Remember the movie Field of Dreams with Kevin Costner? Same concept. You are building something in the hopes that creating the "physical business" will automatically draw in the masses. You believe in your business model and have done your market research. Let's say for example, there is a true need for a donut shop within your community because there is absolutely no donut shop within a 100 mile radius. Does that point alone ensure that you will be successful as a small business owner? What if no one outside of a 10 mile radius knows about your donut shop? Will it still be successful? Doubtful. We live in a online marketing world. Every face you see is embedded into their smart phone and it is your job to be there too. Did you take out a newspaper or magazine ad this year? I am certain you are not the only one. However, you need to be where your audience lives and it is not in a teeny $500 magazine ad that few people will ever see. Do you have thousands of dollars for a full-page magazine ad? For today's online marketing era, you have just flushed your money down the toilet. Do you want to find your audience, your voice, and more importantly your customer base? Locate someone who has already been building that base for years and then pay them to post about your business over their established social media network. Who or what am I talking about? Bloggers. Not only do bloggers give you visibility using their platform of like-minded readers(or potential customers for you), but they can help you build your social media network at the same time. Yes, you can build it yourself, but that is the long road. Why not utilize someone who is years ahead of you and also a savvy social media professional? Bloggers can help you connect with the genuine voice of the people. Say you own a new and hip fashion boutique in town. Connect with the best local fashion bloggers and watch how that increases your exposure, following, and bottom line. It is all about growth and fast growth at that. Your bigger competition is utilizing bloggers right now and it is paying off big time in sales and social media followers. More followers yield more visibility and more sales. So, how do you find the best blogger for your small business? 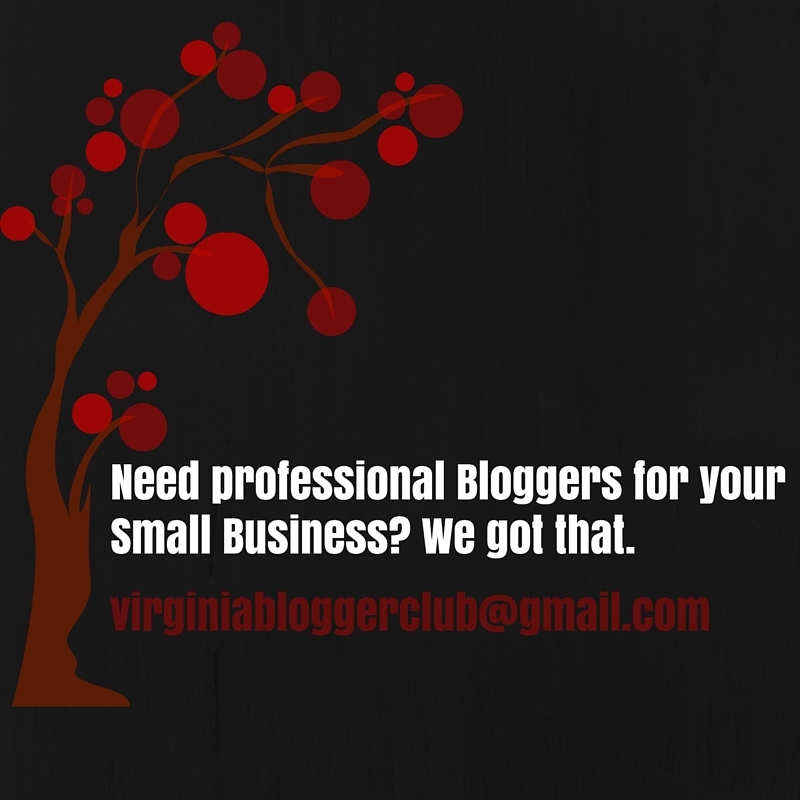 Right here at The Virginia Bloggers Club. 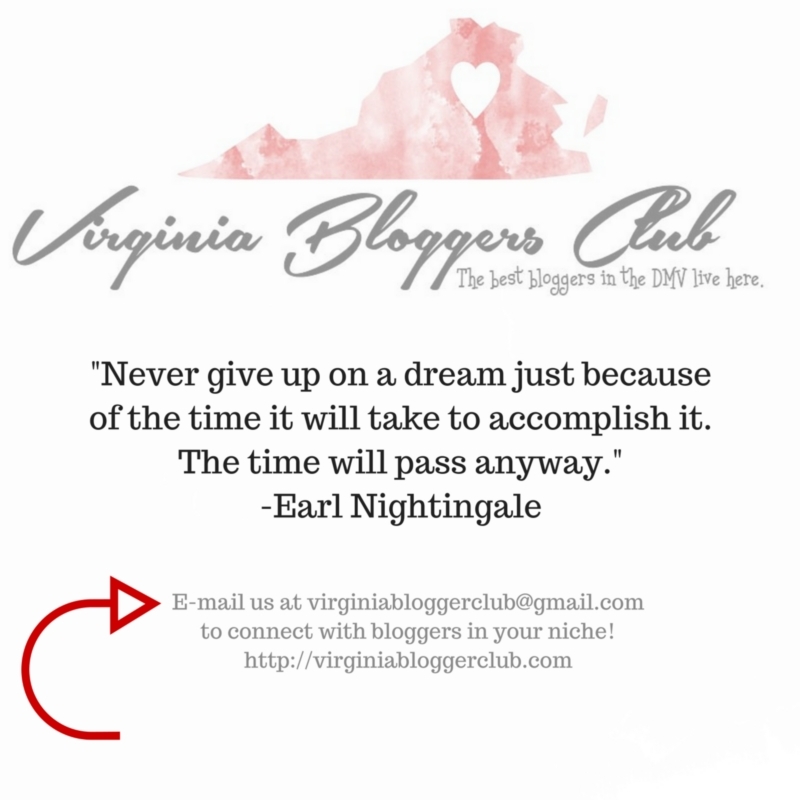 Here is my sales pitch: the Virginia Bloggers Club hosts some of the best bloggers in the DC, MD, and VA area. We connect you with the right professional blogger for your brand and then you decide how they will best work for your business. We connect bloggers to write content, host promotional giveaways, and attend local DMV events for increased social media visibility. The bottom line is we have you covered. We are a small business working for your small business. Our list of services can work with any budget, but you cannot grow if you do not start. The journey of a thousand miles starts today.